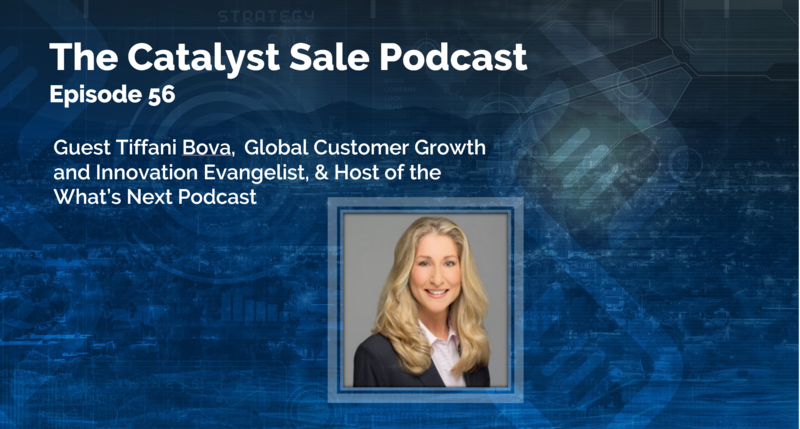 Tiffani Bova, Global, Customer Growth, Sales and Innovation Evangelist at Salesforce and host of the What’s Next Podcast joins us on the Catalyst Sale Podcast this week to discuss innovation within the sales profession, customer experience, taking ownership of your personal development, and a number of other topics. Does your organization describe itself as innovative? Tiffani thinks about this in the context of three phases. The first is optimization, followed by transformation, then finally reimagining the business. When you reimagine the business it is critical that you consider the perspective of the customer or your target audience. How would you reimagine their customer experience? How would you reimagine the way they interact with your business/product/service? How would you reimagine the way your team interacts with your customers? Diversity in teams is something on Tiffani’s mind, but not just from a human perspective. She discusses diversity from many angles, including the impact of machines on team diversity. If your current team is made up of humans, what happens when you incorporate an AI component? This is something we are just starting to see in the market, and it will be very interesting to see how it improves the customer experience. As Sales professionals, there is very little we control. Leadership many times provides rails, or even specific direction on process items, templates or scripts. On a previous episode, we discussed how process, scripts, and rigor stifle the creativity of the sales professional. There is something we do control. Tiffani says, “You control how you are in front of the customer” You control how you interact with the customer, how you engage with the customer, how you empathize with the customer. Through the noise, remember to show up with your best self, understand what’s important to the customer, and adapt. There are a couple of things Tiffani is excited about when it comes to technology and sales. The idea of integrated systems into workflow, including auto logging of activities,which is something that will help us improve in efficiency. Don’t be afraid of technology. From a sales management perspective, we should be thinking less about how can our team make "100 calls" and more about how can we provide tools that help our team identify the "best 20" to call. Sales management needs to loosen up metrics, and we need to move faster when it comes to metrics that matter. One exciting aspect of machine learning & AI in the sales space, is that the machine can learn at scale from multiple experiences. Innovation comes when you reimagine the business and the customer experience. There is a technical consideration when it comes to team diversity, it's not just about gender or experience. Diverse teams may also include AI/Machines as well as a human component. As a sales professional, you control how you interact with your customers, how you communicate, how you serve them. The greatest salesperson is the customer who advocates on behalf of the organization. Build trust, you have to earn the right to ask your customer/prospect for help. Are you an organization generating between 10 and 250M in annual sales? Has growth slowed? Do you know how you will break through your current plateaus? Catalyst Sale has established process to help with this. Contact us today to learn more. Thank you for sharing this episode. If you like what you heard, please provide a rating and/or review via Apple Podcasts, Google Play Music, Stitcher, or your favorite podcast app.